When it comes to brand selection for vinyl windows, architects have many choices —sometimes too many. While many of the vinyl window specifications are written with very detailed performance requirements, there are usually a number of major manufacturers who can meet those requirements. The brand and product choices that architects ultimately make are dependent on many factors: style, function, performance, aesthetics and energy savings to name a few. The brand selection of vinyl windows in particular also needs to be balanced with meeting the owner’s project objectives, including the budget requirements of the project. Therefore, an architect’s brand selection often requires tradeoffs that lead to perhaps a more reasonably-priced vinyl window for achieving his or her vision of the building. Many times the final decision depends on how important the product contributes to the overall success of the project. For many projects, products like vinyl windows are considered a critical building component that require architects to select a specific brand that best meets the project objective. However, proprietary specifications are rare. Products that may not be “performance,” function or safety based are often included in the final document. The architect is often forced to offer multiple brands that can meet a project’s requirements. Understanding more about how vinyl windows fall into such choices — and where a manufacturer’s brand falls in the specification process — can ultimately help a manufacturer positively influence the architects’ selection and preference for products. Monitoring and measuring shifts in brand specifications year to year gives us clues on how a manufacturer can maximize their visibility and opportunity to be the preferred brand. Let’s take a peek, shall we? The comprehensive Architects’ Brand Preference Study conducted by Accountability Information Management (AIM) reveals the competitive nature of vinyl windows when it comes to architects’ brand visibility and preference. There were over 27 different product brands mentioned for those that were “involved” with the specification of vinyl windows. The Preference Study is a blind study. That is, architects were not given choices to select from. Rather, they were asked to list the brand preferences in their minds, thus giving true insight into how they view brands in their thinking. Although the frequency of a specific brands mentioned shift on an ongoing basis, the mindset of the architect still holds true: that is, certain brands are “in their heads” or on their short lists, while others are not. According to the study, there seem to be many factors that manufacturers need to consider when analyzing where they stand in the market and in the minds of architects, especially in relation to an architect’s perception of brands. Most important, understanding an architect’s level of involvement when specifying particular products is really one of the keys to success in specification. The degree to which architects are involved in specifying a specific brand or manufacturer varies by product and other factors, including; the type and size of project, location within the facility, geographic location, etc. For vinyl windows, which are many times accompanied by very specific performance specifications, the decisions for brand selection may be given to an engineer or technical specification professional. In fact, in AIM’s Architect’s Brand Preference 48% of the architects surveyed indicated that they were not involved in selecting and specifying the brand of vinyl windows—this was down from 56% in an earlier study. In addition, while more architects were “involved,” 22% indicated they did not have any type of brand preference. Although architects indicated they have “no preference” they are, in fact, involved in specifying and recommending vinyl windows. However, many times the brand selection may be made by “others” in the specification path. Often, the firm’s “short list” becomes the reference document. These observations are important to assist a manufacturer in maintaining its brand visibility and presence in the specification process. This is especially true if the architect has “no preference” or delegates that decision down the specification path. What should vinyl window manufacturers do to enhance brand selection and preference? How can manufacturers convert an architect’s “no preference” into specifications and recommendations for their brands? To answer these questions, consider what we know about specifications. The key to gaining ground in specifications and preference is to become part of the “basis of design.” This means that the architect or designer is calling out a specific brand that should be used to meet the objectives of the project. And while there will inevitably be other manufacturers listed as possibilities, it is the “basis of design” choice that drives the specification. It only makes sense, then, to become the “basis of design” to enhance brand select and preference of a manufacturer’s product. To learn more about how often “basis of design” is used in vinyl window specs, AIM used ConstructConnect™, (https://www.constructconnect.com/) an online construction database, to get a better sense of how vinyl windows and brands are specified. By searching project specifications for “vinyl window projects with Basis of Design” within a specific year, we can understand more about how the specification for “basis of design” and specific brands has changed year to year. 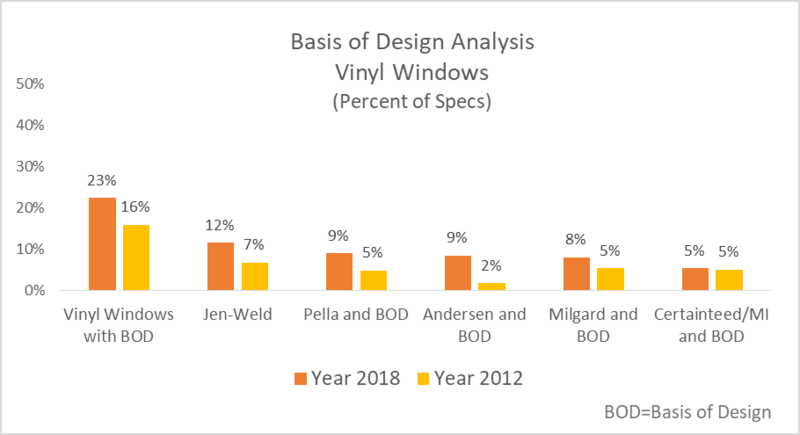 Interestingly, only 23% of projects in 2018 that had a vinyl window project specification also included a “basis of design.” However, this has increased since 2012 where “basis of design” was specified in only 16% of the vinyl window specifications. This type of specification analysis can also show manufacturers how often their brand is specified as the “basis of design,” and if it has shifted over a specific period of time. For example, this analysis shows some brands have made an increase in the specifications where their brand is the “basis of design” verses others where the percent has remained the same. What that means for vinyl window manufacturers is the market is constantly changing. It is, therefore, important to monitor where your brand stands in the specification path. Certainly, there is room for growth and the opportunity to reach and influence the specifications is unlimited. However, manufacturers CAN influence the “basis of design” in these specifications, as the data shows. Doing that needs to start with controlling the architect’s brand preference. The same research can be done on the other product categories or on specific brands conducted in the Accountability Architects’ Brand Preference Study. Let us know where your interests are. Thank you for reading.